I’m tired. That’s not an unusual symptom in America these days, but I find it’s always helpful to acknowledge where I am (as opposed to pretending I’m somewhere else, like on a beach in Tahiti). For the past few weeks, I wake up every day thinking about how tired I am. I drag myself out of bed, caffeinate myself with 2 cups of tea (for years I’ve been a one cup of tea kind of girl–these days I rarely start a day without 2 back-to-back, microwaving them to reheat as they cool quickly during my morning kid-prep rituals), feed the kids, send one (or both) kids off to school, and then I tackle the day. Over the years I’ve become pretty adept at powering through exhaustion and from a young age I adopted “get busy and get working” as a survival mechanism to carry me forward in life. Whenever I have to fill out a health history with a new doctor I call up my parents to refresh myself on our family “conditions.” We’ve got some of the typical physical medical conditions you’d expect (cancer here, diabetes there), but the ones that dominate our family tree are mental health issues and addiction. I’ve grown up with the gift of knowing this, and it’s provided a certain lens for me to consider my life, behaviors and habits through. Over the years I’ve learned that I can’t let myself spiral too far down any path without checking in–with myself, with my husband, with my “people” who help me stay accountable. And as I write that, I’m also clear that sometimes I DO let myself spiral a bit too much. I go unconscious, I become obsessed with to-do lists (and checking things off of them, is there anything more gratifying in life than that I ask you?! ), I get busier and busier and busier…until I crash. My game these days is to try to catch it before I go too far down the rabbit hole or swing too far on the pendulum that I can’t contain the fallout. So, enter April 6, 2015. I’m freaking tired. I wake up and my eyes hurt and they just want to close again. Yet I find myself awake till well after midnight many nights, trying to squeeze it all in and make it all happen and validating this behavior by checking things off my damn lists. Oh the joy I find when I get to place that list in the recycle bin, completed (or transferred to a new and fresh list!) and no longer needed. What I think I’m seeing is that this week is my crash week. Mercifully it’s been a softer landing than some crashes of my past. I woke up Monday with my eyes burning and a nap on the brain (I RARELY nap). I had just finished weeks of tax prep (love me a good deadline to keep me focused!) and knew I had a little wiggle room to decompress. Monday is one of two days Cooper’s in preschool, and I didn’t have any commitments or appointments until noon. I blissfully crawled back into bed after driving Cooper to school and rested my eyes for about 90 minutes. Although I never really slept, I woke up feeling better than I had in weeks. Tuesday was another crazy day, lots of errands (doctor visit, blood draws and voting, oh my!) peppered with some fun (lunch with Tricia, a stop at Pepe’s work and a visit to the McDonald’s play place, culminating in a parent/big brother share day at Cooper’s music class). Wednesday was another chill day, and this time Cooper joined me (I think he needed the down time too). Thursday–crazy. Friday–chill. As Cooper’s pals on Team Umizoomi would ask, do you see the pattern? When I get a little bit of down time, I can actually reflect on the madness instead of just living it, powering through, and manically creating my lists. What I’ve realized this week is that the last 5 weeks or so of my life have been like the start of a giant spring cleaning campaign. Some of it has certainly been directed at my home and physical space, and some of it has been directed at the structures in my life that need to shift as we transition into a different phase of life. If I look further back, I can see that this energy of “taking things on that I’ve neglected for years” started at some point for me in spring 2014. What I finally did 5 weeks ago was physically open up more time and space in my life to actually address the items that I’ve ignored. Part of that opening came from leaving my part-time job to go back to school. When I chose to go back to school to get certified as a health & wellness coach, I chose to finally honor myself by following my passion in life, and all the “side projects” that have kept me up late at night now get to be central stage. I also know that pushing alcohol out of my life for 2015 has created a sometimes surprising space of productivity and accomplishment. It has forced me out of a default mode (i.e. when I put on my apron to cook a nice dinner I pour a glass of wine) into a more conscious state of living. I knew it would, I just didn’t realize all the corners of my life it would touch. Just like all other moments in a long life, I know that this phase too shall pass. There will come a day when every room in my house feels like it’s some form of “done” and I will be caught up on my finances monthly and my email inbox will not feel like it deserves it’s own zip code. And probably when those things happen I will have other things falling apart at the seams. Such is life, in all its glory. 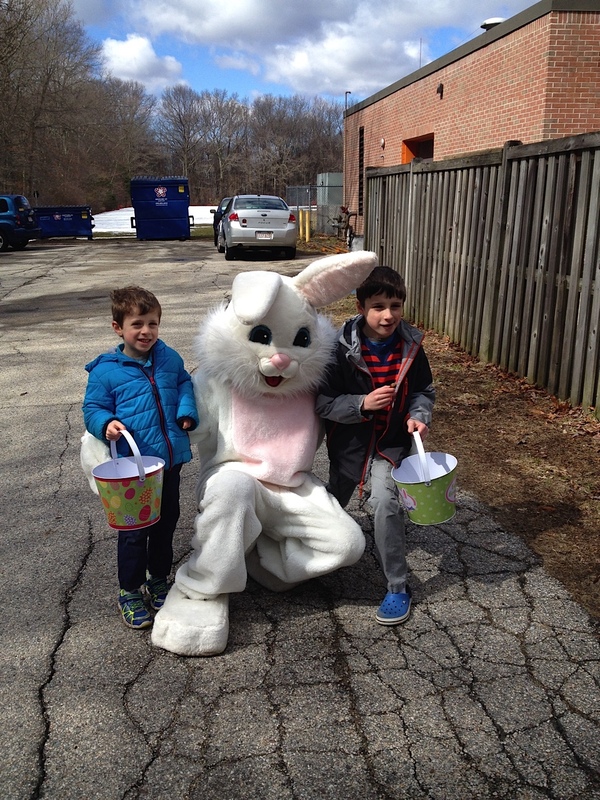 We prefer to meet our Easter bunnies in back alleys. Coops and Lady just hanging out with the dust bunnies under my bed. 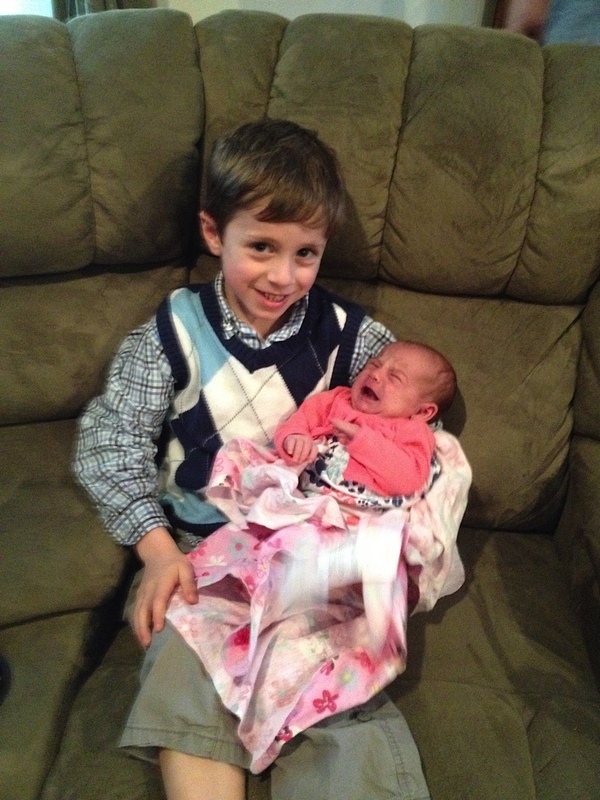 Cooper is so proud to hold his little cousin Kenadee! 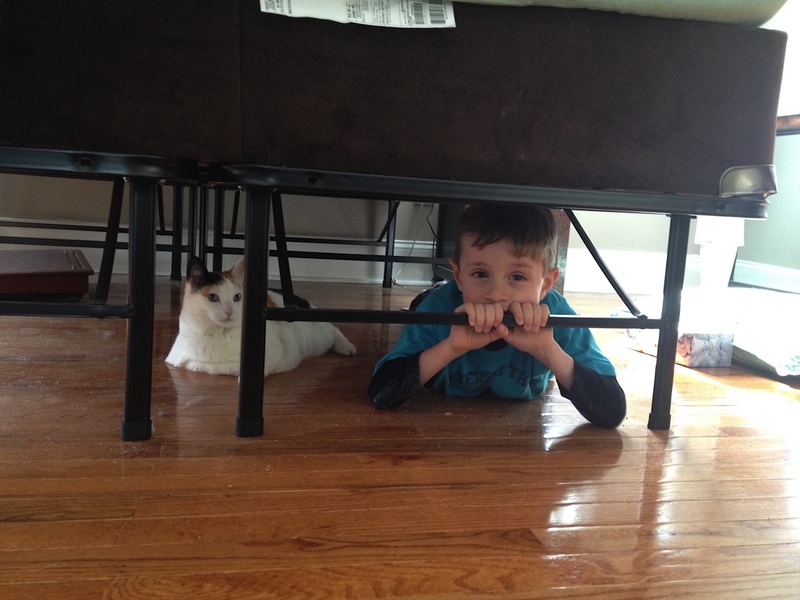 These 2 have gotten along amazingly well from the beginning…and how cute is that bum?! This entry was posted in Daily Life, Reflections, Year of Radical Wellness and tagged balance, consciousness, down the rabbit hole, exhaustion, mental health, motherhood, Radical Wellness, spring cleanup, wellness. Bookmark the permalink. Thanks Sandy!! I have a slight obssession with Alice (what little girl of our generation didn’t?) and so often feel like I’ve stepped through the looking glass!